Pre-heat oven to 350 degrees Fahrenheit. Butter a bundt pan and coat with flour, dusting off any excess flour. In a stand mixer, beat the butter using the paddle attachment on medium-high speed until soft and creamy, anywhere from 2 to 3 minutes. Add the sugar and continue beating until fluffy and puffy. Combine the flour, baking powder, baking soda and salt in a bowl. In another bowl, mix the eggs with vanilla and sour cream. Reduce the mixer speed to low, and take turns adding flour mixture and egg mixture. Continue beating until thoroughly combined, scraping down the sides with a rubber spatula if need be. Transfer 1/3 the dough to another bowl, leaving the remaining 2/3 of the dough in the mixer. In a small bowl, thoroughly combine the hot water and cocoa. With a rubber spatula, fold the cocoa mixture into the 1/3 of the batter set aside in an extra bowl until thoroughly mixed. Set aside. To the batter left in the mixer, add the orange zest, almond extract and orange juice, and beat until completely mixed. With two ice cream scoops or measuring cups, alternate dropping the chocolate batter and the orange-almond batter into the bundt pan. When all the batter is in the pan, run a butter knife or a skewer through it to create the marbled look. Bake the cake for 50 to 60 minutes, until springy to the touch, lightly browned and a toothpick inserted comes out moist, but not wet. Remove the cake from the oven and let cool. Once cool, run a butter knife around the cake and invert onto a platter. Sprinkle with confectioners’ sugar and serve. Absolutely! You will have to adjust the bake time a bit, so keep an eye on it. Thank you! Made this cake during the week! But will make again today. It’s really good. Just the on I had was a little smaller and it over filled. Will have to make cupcakes or something with the rest of the batter so it doesn’t overfill. Oh cupcakes will be great! The recipe is easily halved – a bonus for a small family with a small bundt pan. Fabulous cake! Easy to prepare with readily available ingredients. Super moist and the flavours remain distinctive yet complement each other well. A definite keeper! So glad you enjoyed the flavors and that it is a keeper, Oriana! What is the size of the bumdt pan used in the recipe please? I used a round bundt pan that is about 10.5″ diameter and 3.5″ height. Enjoy, Anjali! Forgive me if I’m missing something, but I really want to make this cake. In comparing this recipe to what you made in the episode I saw it on, I’m not sure what to do with the sour cream? You don’t use it in the episode 10 season 6. Please help. Oh sometimes I tweak recipes after the show to make them even better, Adam. Please follow the recipe that is on the site (with the sour cream). Enjoy the pound cake! Pati, do you have a recipe for pan de polio? I just noticed I misspelled a word. It should have said “pan de polvo.” Spell check changed my word. BTW, I did make your cake yesterday, and it was delicious. My husband did want some kind of orange glaze. Do you have one that you would recommend? I am going to make this today. Looks delicious. Love your show and your stories. Thanks for having this recipe. Great recipe again, Patti! Thank you. The cake is delicious with the perfect balance of flavors. It’s not too sweet which I love.I had some batter left over as my bundt pan is a little smaller. I used the batter to make cupcakes. They were as much appreciated as the cake itself. So excited to try this Tiger Pound Cake. Does anyone know if you can taste the orange in it? You can, Judith! I hope you enjoy it. Just inverted my perfect Tiger Pound Cake and will be delivering a few delicious pieces to my good friend Nicole. I had to try a slice and it is heavenly tender, moist and perfectly not too sweet. My husband and I love your show Pati! We especially appreciated the one on the Yucantan. Super! Say hi to your friend Nicole and your husband for me. I wrote earlier about the Tiger Cake getting oily and gummy. The folks at King Arthur Flour said it was because I over-beat the mix after adding the flour, causing it to rise like a soufflé, then collapse in a dense heap. It should have been only gently and briefly mixed in. I will try it again that way. Thank you again for a lovely recipe and charming TV show. Oh thanks for sharing Ann. Good luck the second time! The flavors of this cake were divine and the tiger stripes were stunning, but my cake turned out very oily and a bit gummy, while the crust was approaching black/brown. Oven is good. I’m going to try again with different flour and baking powder, and a tiny bit less butter. Any other suggestions? I want to get it right, but I’m not an experienced baker. Love your show! Thank you. Oh no, I’m so sorry, it’s hard to pin point exactly what it is, but maybe that it was just overlooked by a few minutes? I love you Pati! Thank you for inspiring me to learn how to bake! I’m so happy to hear you were inspired to learn to bake, Ruby! if I wanna make a smaller cake, should I divide all the ingredients into half including the baking powder, baking soda, vanilla and all other small ingredients? or just use half the flour, butter,eggs and sugar? Yes cut all the ingredients in half if you want to make a smaller cake. Hi Pati I have been watching you on PBS Ch.24-3,but haven’t seen your show of late. When will your show air. Thank Cathy. Lewisiville, Arkansas… I ‘m going to try the cake. Although I’ve been baking for many years, I had never made a marbled cake. Yesterday I made this one – and its amazing! My husband says its the best tasting cake ever, and it is simply beautiful. I cut the recipe in half and baked it in a 6-cup bundt pan – perfect! Awesome! I’m so happy to hear you and your husband enjoyed the cake. Oh I’m glad you made the recipe your own, Nicole! Pati me and my 10 yr old daughter love your show, and tried this pound cake recipe, and it came out delicioso!! Thanks for your recipes and passion for comida mexicana. Oh thank you Mark, and please say hello to your daughter for me. Pati I would love to make this. In fact im going to try bake it very soon. Would you recommend a simple nutella ganache recipe to make to put on top please? If you want, you can use the ganache from this recipe: https://patijinich.com/recipe/chocolate-crepe-tower/ But it is also really good on its own. I am going to make this in a few days. If I am unsure if my bundt pan is big enough (10×3.5) could I just adjust how far up I fill the pan so the batter doesn’t overflow? Yes…and you can make less batter too 🙂 or make two bundts! Thanks for your reply, love your show! Grandson’s just checked in –“The Cake is amazing!” High praise from two 16 yrs. olds. My lunch group also thought it delicious. It’s worth a new mixer to be able to make this on a whim. Could not be a better cake. I know why his Grandmother was impressed. That’s awesome…so happy to hear this! I love this cake. I have made a similar cake for years to celebrate my twin grandson’s birthday, but this definitely takes it to the next level. My 20 yr. old mixer groaned and moaned with the amount of batter, but it was all worth it. Oh I’m glad to hear your mixer made it through 😉 And I’m so happy you love the cake! I’m gonna make this , just watched you on the tv . Thank you for this recipie. I made this for New Year’s and it was a hit! This reminds me of “mantecadas”. I have a brunch coming up and would like to make this recipie as a muffin. Do you have any suggestions on baking time? And once again thank you for your culinary inspirations. Oh they will cook quicker in a muffin and it depends on the size of your tins. Keep on eye on them and check them with a tooth pick (it should come out moist not wet) and the muffins should be lightly brown. Have a great brunch! I have a question. I made the Tiger Cake yesterday and it was much thinner than what I saw on your program. So much so, that the plain and chocolate batters just ran together when i spooned them into my pan. Any thoughts? I’m excited to make this for my husband’s Birthday. He was born the year of the Tiger and he loves orange juice, so I expect this will be a hit! 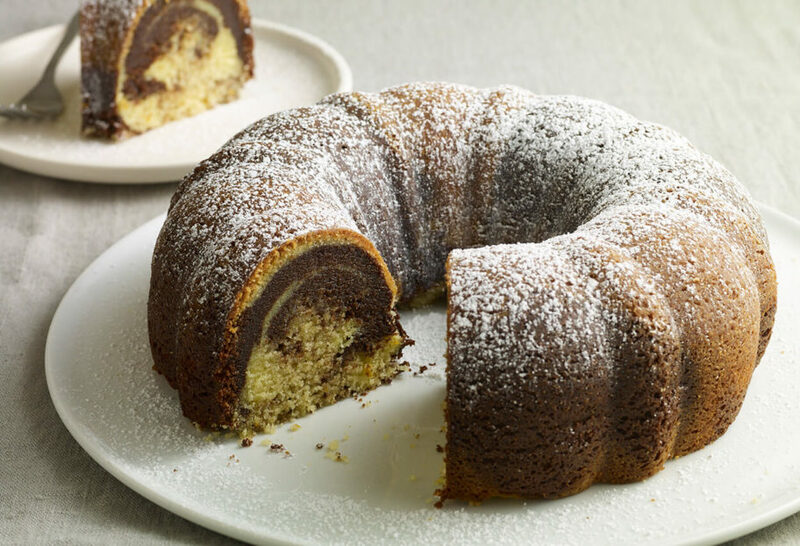 What size bundt pan should be used with this recipe? I enjoy your show, you are a lovely lady! My round bundt pan is about 10.5″ diameter and 3.5″ height. Enjoy the cake! I appreciate your recipes and enjoy your cooking program inmensly. I feel very inspired by your love to México and its culture. I live in the border between El Paso, Tx and Juarez, Mx. and are faced up daily with the challenge to keep my roots but also embrace my borderlander reality and cooking mexican dishes with an American twist really works for me and my family. I suggest for your program northern border dishes we also have a very unique cuisine (burritos, tacos de discada, chile pasado, machaca con huevo, menudo norteño, queso menonita, quesadillas de asadero, etc.) that is also part of Mexico’s comida. Oh I’m sorry to hear this…you may want to use a bigger and higher bundt pan or cut the recipe in half so it doesn’t spill over. Oh wow thank you so much Valerie! This made my day. Have a wonderful holiday and Happy New Year!!! I made this cake today and is so moisture and delicious !!! I hope you love this pound cake, Marilyn! The recipe doesn’t specify natural or dutch process cocoa. I assume natural. Would you confirm? Thanks. You can use whichever one you prefer…both work! My husband just came upon your show one Saturday several months ago. When I saw the episode for Tiger Pound cake I couldn’t wait to try it. My mom loves pound cake and I made it for her birthday, she was thrilled with it. I also took a cake to work, it disappeared in no time. It was a huge hit. Thank you for sharing this. Oh thank YOU for sharing that it was such a big hit! I was so excited to make this recipe for my family after my father saw your show and announced that he just HAD to try this cake! Unfortunately, despite following the recipe so carefully, it never fully cooked in the oven, despite the beautiful brown crust on the top (and I baked it for 60 minutes at 350!). The outside of the cake was very pale and slumped over, with the middle very greasy/gummy and unbaked in the very center. I’m wondering if the reason was my pan–it is an older bundt pan that is a very pale light metal, not dark like yours. I wonder if it would have browned better if I had used a darker pan instead. I ended up salvaging it by slicing it and then baking the slices on a tray in the oven so it could finish, and my family still loved the flavor. I would appreciate any suggestions you might have or insight into what might have gone wrong! Thank you, and Happy last night of Hanukkah! Oh no… so sorry to hear this! It may be the pan, it may be the temperature too! But if your oven works at normal temperatures and times for other recipes it could be the pan. Hola Pati! We love watching your show on Create TV when we can catch it, and this weekend we saw this episode. You made the making and eating of this cake look so enticing, I just had to make it! It did not disappoint, however I wonder what might have made my batter so high and fluffy. The only thing I could think of that might have made a difference was that I only had 3 sticks of butter, and had to use 1/2 cup of cream cheese to match the 2 cups of butter required in your recipe. It really was a luscious looking batter, my kids and I were tempted to just eat it like a rich whipped custard. The crumb matches your photo, but I had entirely too much batter, and, anticipating that the cake would spill over my bundt pan while baking, I put a cookie sheet on the bottom rack to catch the extra batter, and ended up with a 2nd cake, “freeform style” haha. But for making a cake like this for the first time, I was impressed with how wonderful this recipe turned out! Now I just have to find a larger cake pan or try what someone else suggested and make mini loaves. I am so grateful to you for your hard work and example as a professional who is successful at doing what she loves while keeping family life a priority. Can’t wait to try more of your recipes. Muchas gracias! So happy it worked as a double cake!! My bundt pan is indeed high. You can cut the batter in half for the pan you have!! Question about the cocoa powder: Dutch process or natural? Or does it make any difference? I JUST DISCOVERED THE CREATE CHANNEL AND YOUR DELICIOUS LOOKING TIGER POUND CAKE. I AM EAGER TO TRY IT. IT LOOKS LIKE A VERY SPECIAL DESSERT. I LOOK FORWARD TO YOUR SHOW AND WISH YOU THE BEST IN ALL YOUR ENDEAVORS. Thank you Bonnie! I hope you enjoy the cake and many other recipes! My husband loves this cake!!! I will be making it again. My thanks also for your excellent explanations of the true flavors of Mexican heritage and culture. You teach more than just cooking! Please don’t ever stop, you are wonderful. Mil gracias! Y Felices Fiestas! Hahaha! I hope you and the husband love the cake! Looks great! What is the best size bundt cake pan for this? I used a regular round bundt pan, which is about 10.5″ diameter and 3.5″ height. I hope you like the cake! Love you, love your show! Your take on Mexico, family and friends is heartwarming. You not only provided interesting recipes, but make me so relaxed and smiling while I watch. My question…if I cut the recipe in half and bake it in a half size bunt cake pan, how long should I bake it? It should just be about 6 to 10 minutes less…check with a toothpick and take out as soon as toothpick comes out moist but not wet. My grandboys helped me make this, so fun! I loved your story about your husband’s grandma questioning you, you always touch my heart. This may be our new Christmas tradition. I’m so glad your grandboys helped out! And that’s awesome that it may be a new holiday tradition! This looks wonderful! Want to try it out but do you think I could substitute vanilla extract for the almond?? While I love almond flavor, my family are not big fans of it. Ola Patti. Because you made it look so easy I’m ready to make my very own, tiger pound cake. Because I’m always looking for unique ways to turn an ordinary cake into something special, you made it happen. Thank you for showing how to make this delight. As well thank you for your cooking show on create tv as I do not have cable or sat tv. I live in Ontario Canada. Where does one find bitter orange and eposote out this way. You can find them at your local latin market or international market…or online. Also for the bitter orange if you can’t find it here is a substitute https://patijinich.com/recipe/bitter-orange-juice-substitute/ I hope you enjoy the recipes! Guess it work Pati you never lelf the house really, how Wonderful it a must try your version love pound cake, love my friend in the Mexican kitchen. Oh my but this looks so delightful! I’ve made something quite similar to this, but look forward to making this one. Thank you, thank you! I hope you love it Patte! I just made your tiger cake!it smells so good! Can’t wait to try it tomorrow! I hope you love it Petunia! Wondering how the recipe would translate into mini loaf pans? Considering using this cake for Christmas goodies. Absolutely! Just bake them for 6-7 minutes less. I have discovered your program recently…you are such a joy to watch and your passion consent across the tv! I made the pastel tigre today and next time I will cut down the almond extract by 50% otherwise it is a wonderful cake. Thank you for sharing your recipe with us! This cake is delicious! I made it and my family raved about it! I will make again! Nos encanta tu programa y esta vez mi hija Ariana de 8 agnos de edad y yo hicimos el tiger cake. Lo disfrutamos mucho. Mil gracias Mary y Ariana! ENJOYED WATCHING YOU MAKE THIS, GETTING INGREDIENTS TODAY TO TRY MY HAND AT MAKING.